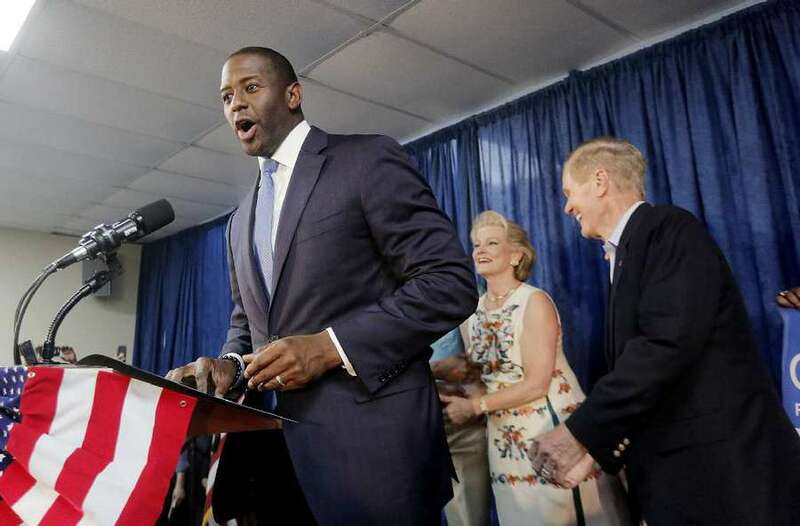 Gillum and Nelson’s first joint appearance of the general election campaign heralded a new era. ORLANDO — Andrew Gillum and Sen. Bill Nelson represent two diverging camps of the Florida Democratic Party. But at a rally Friday afternoon, party leaders sought to sell them — and a slate of down-ballot candidates — as a unified ticket that could reverse a 20-year losing streak in the state and preserve their foothold in Washington. The unity rally in Orlando Friday smacked of old-school Democratic politics: the patriotic bunting, a union hall setting, the requisite appearance of various elected officials making nice after a primary fight. But Gillum and Nelson's first joint appearance of the general election campaign heralded a new era. "You spoke on Tuesday and you said you wanted new ideas, you wanted fresh faces, you wanted something different, you wanted change," said Sean Shaw, the Democratic nominee for attorney general, in a speech. "You got it." Nelson, 75, said he ceded the final speaking slot to Gillum, 39, the party's nominee for governor, so he could have the chance to praise the rising party star. "I asked to be here to speak before Andrew so that I could introduce Andrew and say all those things that Rick Scott has done in the last eight years, we're going to reverse that," Nelson said to cheers, referencing Florida's GOP governor who is challenging the three-term senator in November. Nelson is running for a fourth term based on a brand of pragmatic centrism ripped from a well-worn playbook that has resulted in a string of crushing defeats against strident conservative candidates in state elections. Yet it's worked for Nelson, whose ads this time in his race against Scott aim at swing voters by touting his independence from party doctrine. He left Friday's event to catch a plane to the funeral of the late Republican Sen. John McCain. Gillum, who in the primary decried the centrism of Democratic nominees past, reflects a new approach. He ran an unapologetic progressive campaign, advocating for the legalization of marijuana and medicare for all. And although Gillum didn't explicitly mention those policies Friday in a 15-minute speech, he did speak at length about his personal story. Under 40 and black, Gillum is a reflection of much of the party's progressive base. "He's the talent that our party has waited for for so long," Chris King, one of Gillum's Democratic primary opponents, said to raucous cheers. Democrats hope to meld the approaches of both high-profile candidates — Nelson's pragmatism and Gillum's idealism — come November. "In the best of all political worlds for Democrats, these two messages would mobilize every faction of the Democratic base in Florida," said Aubrey Jewett, a political science professor at the University of Central Florida. Gillum's progressive bent, said state Rep. Carlos Guillermo Smith, D-Orlando, is particularly refreshing. "Andrew Gillum's nomination was good news for every Democrat on the ballot," said Smith, who endorsed Gillum before the primary. "This pumps energy, excitement into the Democratic ticket unlike anything we've seen before." If the attendees at Friday's event were any indication, the Democratic Party, centrist or progressive, is plenty mobilized. Dennis Huffington, a retiree from Orlando who voted for Gwen Graham along with his wife, Gail, said although some of Gillum's stances run too far to the left for his liking, he'll still vote for the Tallahassee mayor because he wants to oppose President Donald Trump. Mike Dumont, 59, a retired operations worker who proudly donned a "Democratic Socialists for Medicare for All" t-shirt Friday, said he was excited by Gillum running to the left in the primary. "There was no doubt that this cycle, he had a message that resonated with people," said Dumont, 59. "Mr. Gillum is the woke Obama." But it's important to note that Gillum won just over a third of the vote in a five-way primary, so centrism isn't necessarily dead just yet, Jewett said. For his part, Nelson shrugged off the differences between himself and Gillum. After the event, Nelson asserted Gillum's policies weren't too progressive for Florida. "You characterize it as being to the left. You look at his positions, they're mainstream: strengthening education, pay teachers, clean up the environment," Nelson said. "Go through all the issues and I think that's where the people of Florida are."